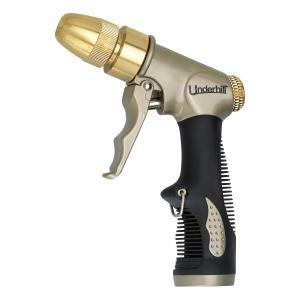 The ProSpray hose nozzle is part of Underhill's Proline™ Gold Series hose nozzles. The variable spray adjusts from a jet stream to a fan spray pattern by simply twisting the end of the nozzle. The durable machined brass and stainless steel, powder-coated finish with rubber comfort grip make this nozzle perfect for many applications. With Underhill products, you get professional quality with competitive pricing.